Can you guess where we were?? 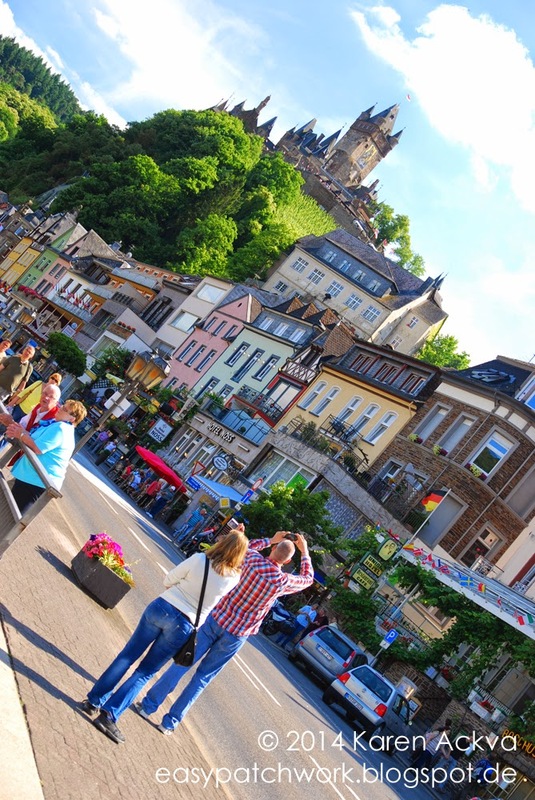 We were in Cochem and there was a very nice little wine festival going on as well on exactly the same weekend! What a cooincidence and to our luck. 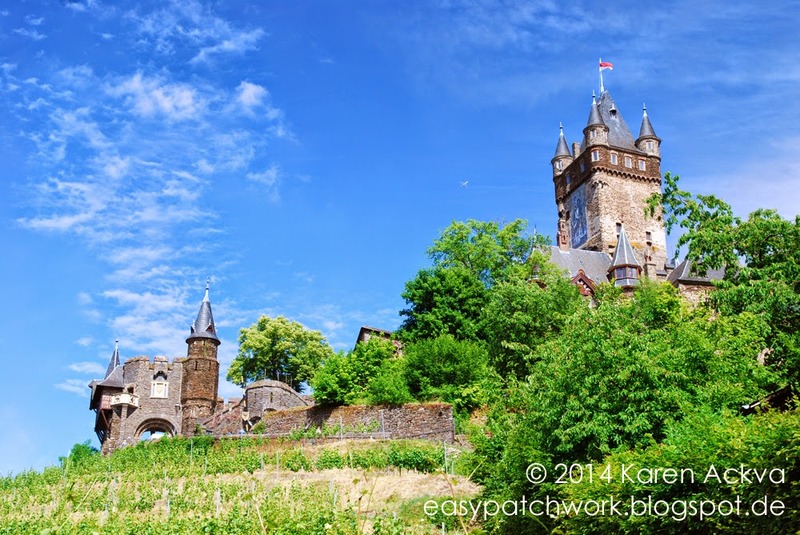 It was so enjoyable to spend time just with my husband listen to good music and sipping on great Mosel wine with such awesome weather! 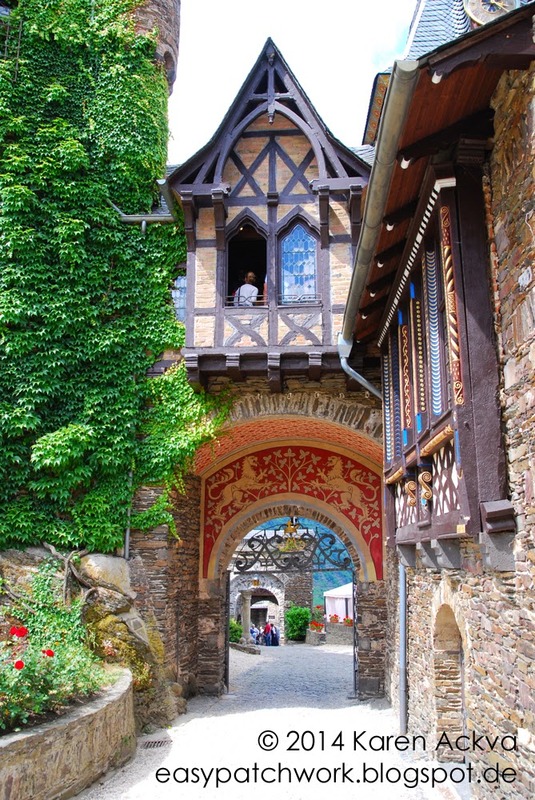 What had a very romantic weekend filled with a river boat excursion to a castle ruin, fine dining, a tour of the castle and walks along the Mosel. Life doesn't get any better than this! 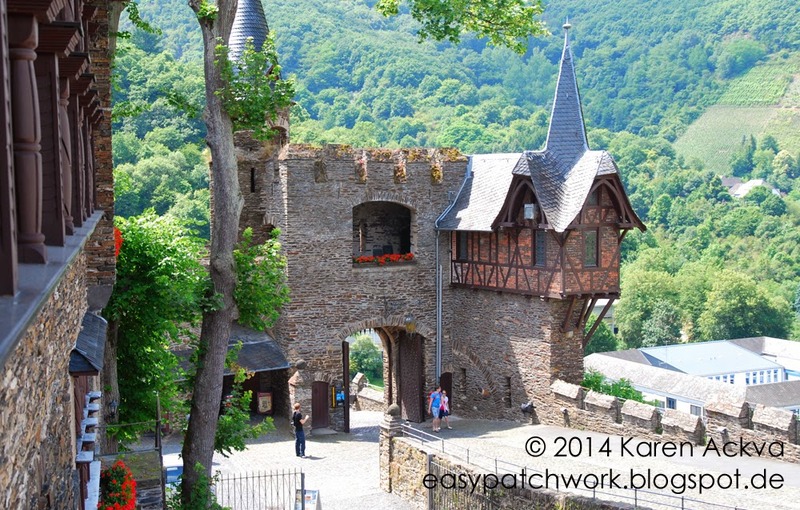 Here are some impressions of our mini vacation. Sometimes I have to remind myself how great it is to be living my own dreams. 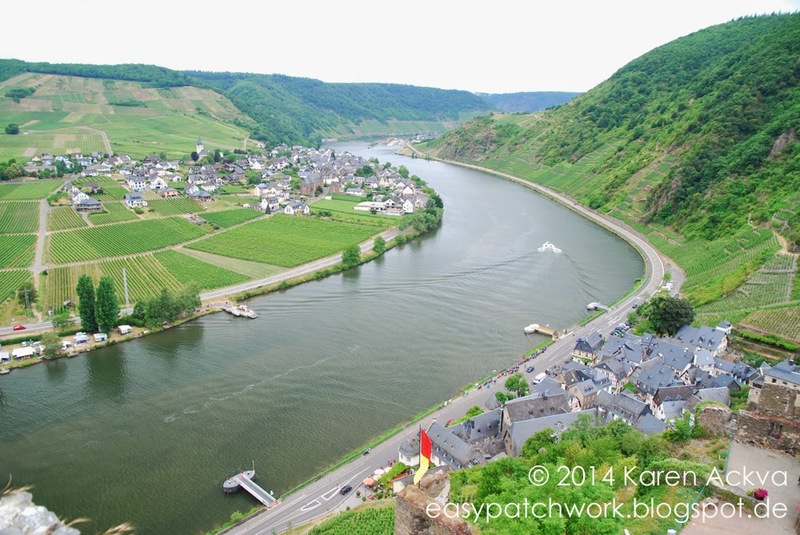 We took a little river boat cruise to Beilstein. It wanted to sprinkle a little, but stayed dry for the most part. 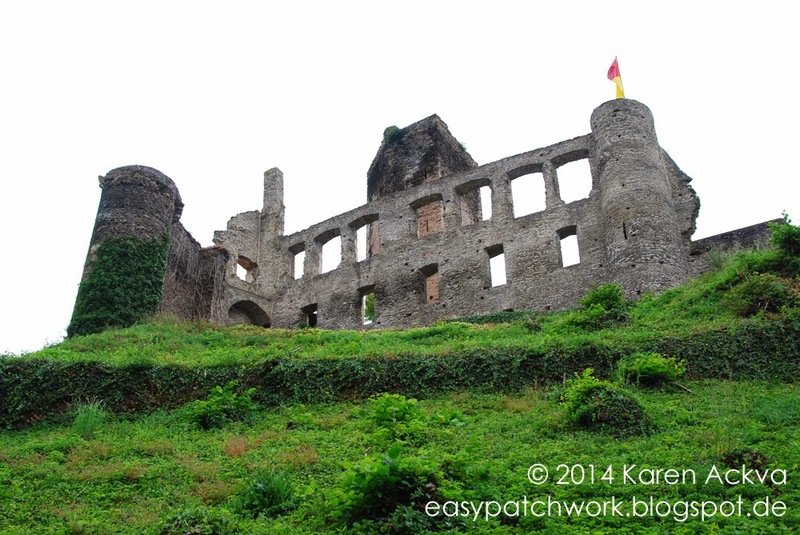 We visited the castle ruins and the church/monastery as well as having a little appetite refresher. I ate a most fabulous split pea soup with ham. Oh, yummy! 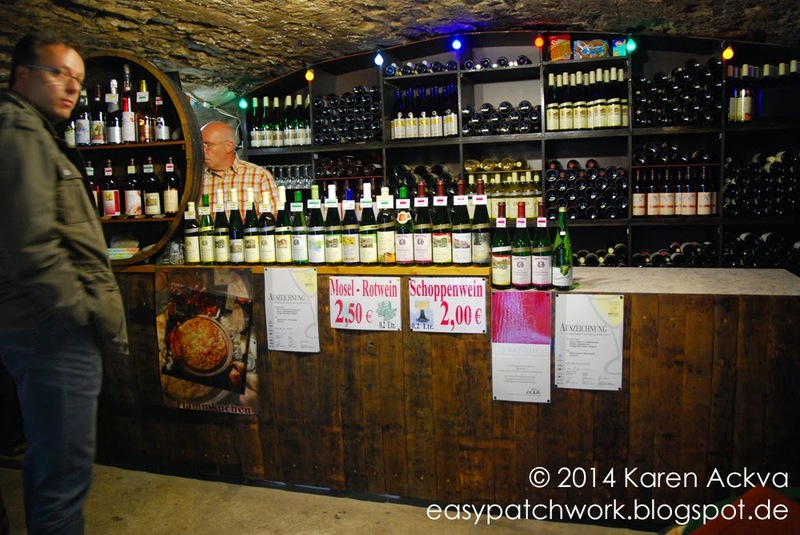 After lunch and a bit in our tummies, we tasted some award winning Mosel Riesling and a glass of Kerner. 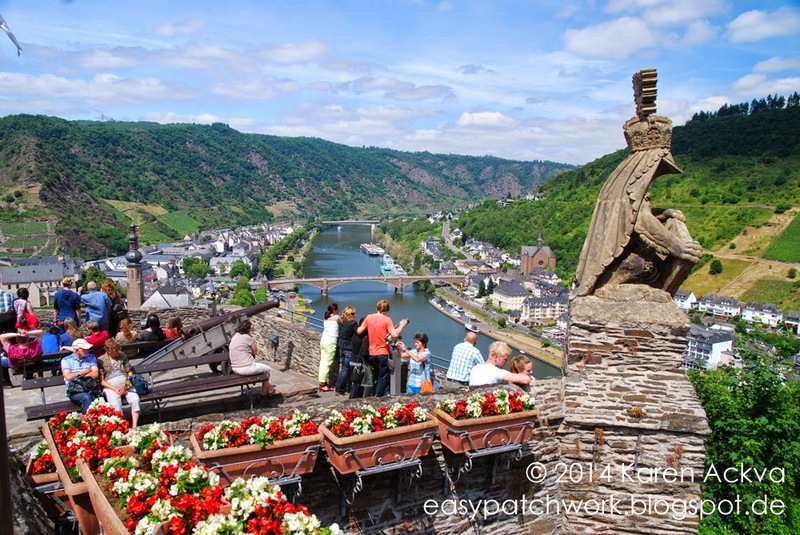 Back to Cochem an der Mosel for a site seeing tour of the Reichsburg Cochem - the castle where we got married and had a champagne reception. We were very fortunate on our wedding day with great weather as well as on our second honeymoon. Thank you for joining me on my little vacation tour. And thanks for dropping by! 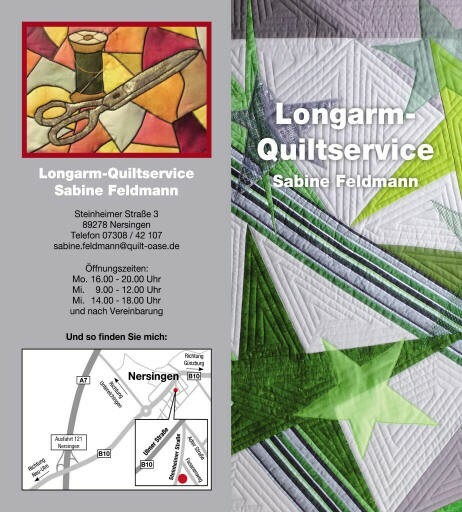 As my Stoffvorrat slowly comes to an end, (not really, but it seems that my fabric is going quickly), I was thinking about ordering some more. Where to buy? 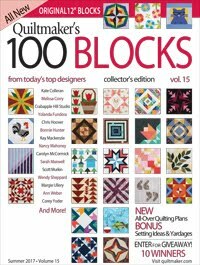 Unfortunately, there is no fabric store around me that offers the most current collections from big name companies including precuts. When I buy fabric, there are usually two ways I do it. I either buy according to a project, or I buy what I like, usually within a collection, so I don't have to figure out if it matches or not. I LOVE precuts! 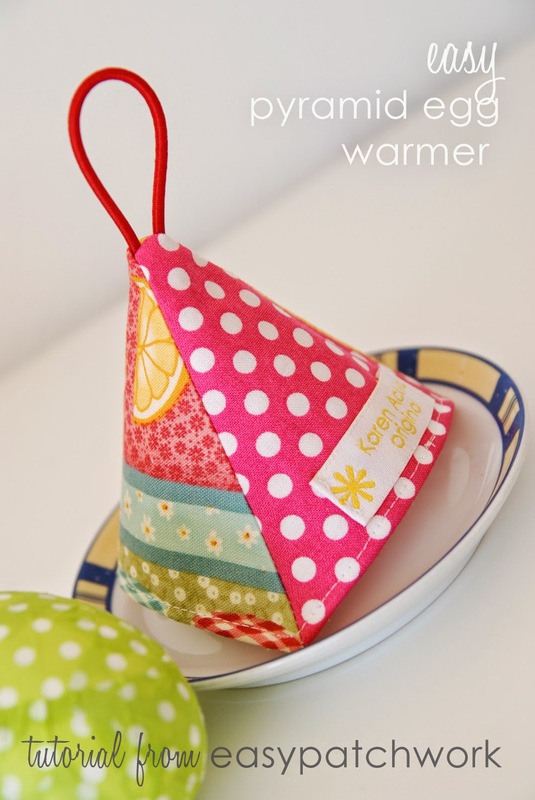 - strips, charms, layer cakes, and fat quarters. I used to buy loads of reduced fabric, because by the time it gets to me, it won't be current anyway considering transport and Customs. 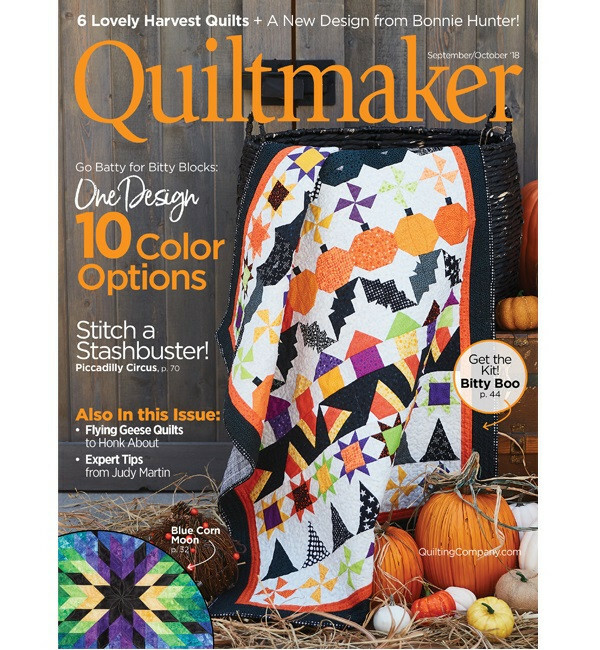 I stopped this simply because I was buying too many country and civil war fabrics. Most of them have been weeded out. 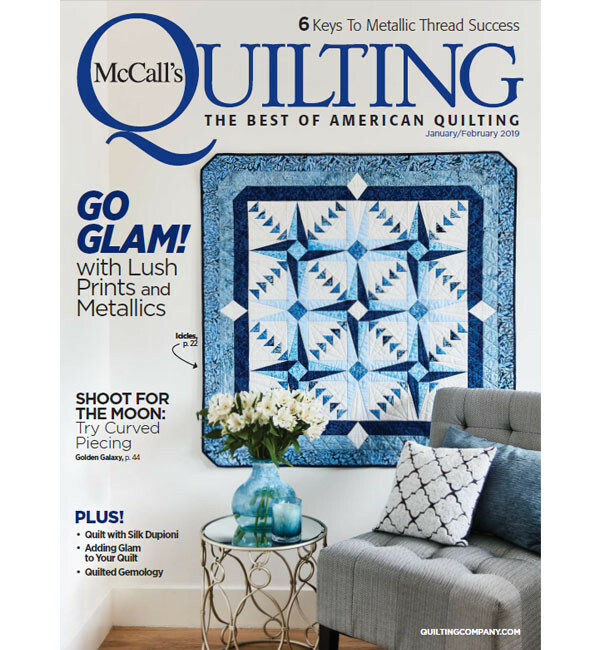 In the early years, I didn't really know where to find pretty quilting fabric that was "up-to-date" or modern. I am not really into flower prints. 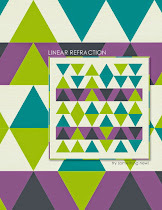 I prefer tone-on-tone (TOT) or geometrical fabrics. I like a range of print scaling too - large, medium and small or no print aka solids. 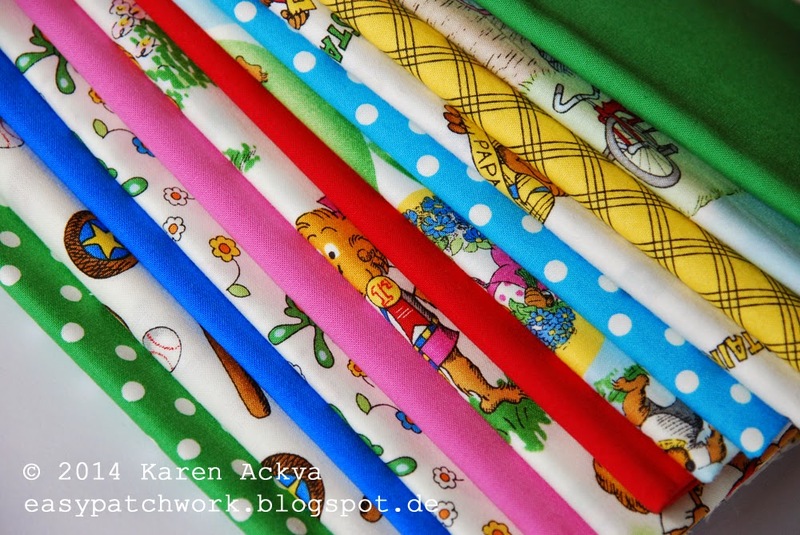 I remember buying up some Berenstain Bears fabric called "Welcome to Bear Country" and thought the artist didn't get the memo on designing fabrics for quilters who need a range of different scaling. The collection consisted of primarily medium prints with one large scale. It helped by bringing in alternate solids. I made a really nice pattern using the prints from the main characters by stacking them, slicing and sewing back together. 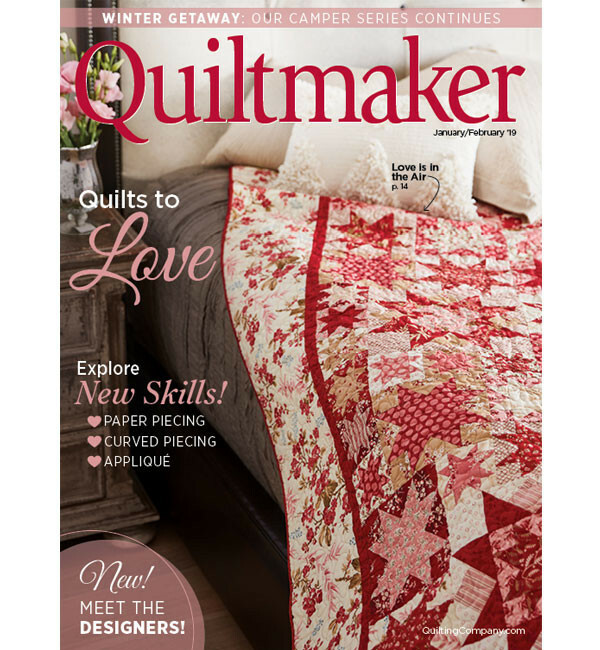 If anyone has sewn together this quilt, I would love to see it. 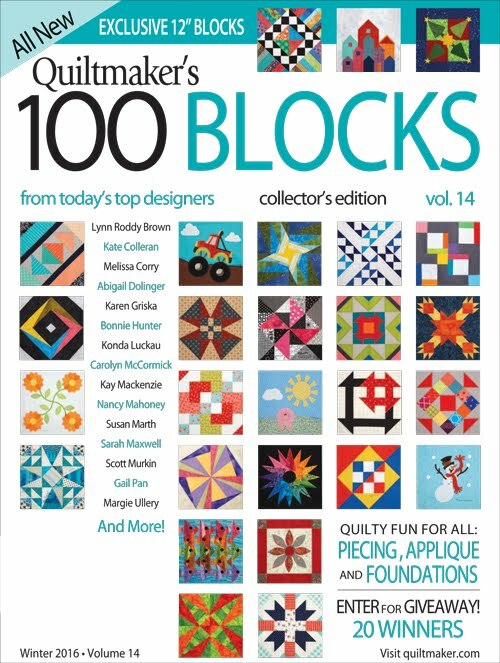 You can get the pattern free on Craftsy. There are directions for two different sizes. 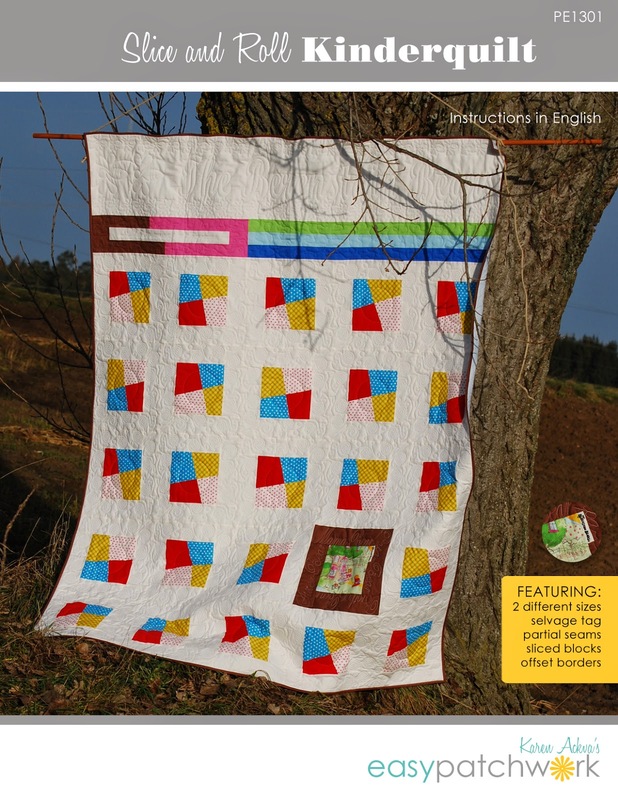 Brigitte Heitland did the most beautiful job at quilting it too especially with "Berenstain Bears" text at the top! Back to fabric stores...I found a couple of really nice online fabric shops over the last few years. 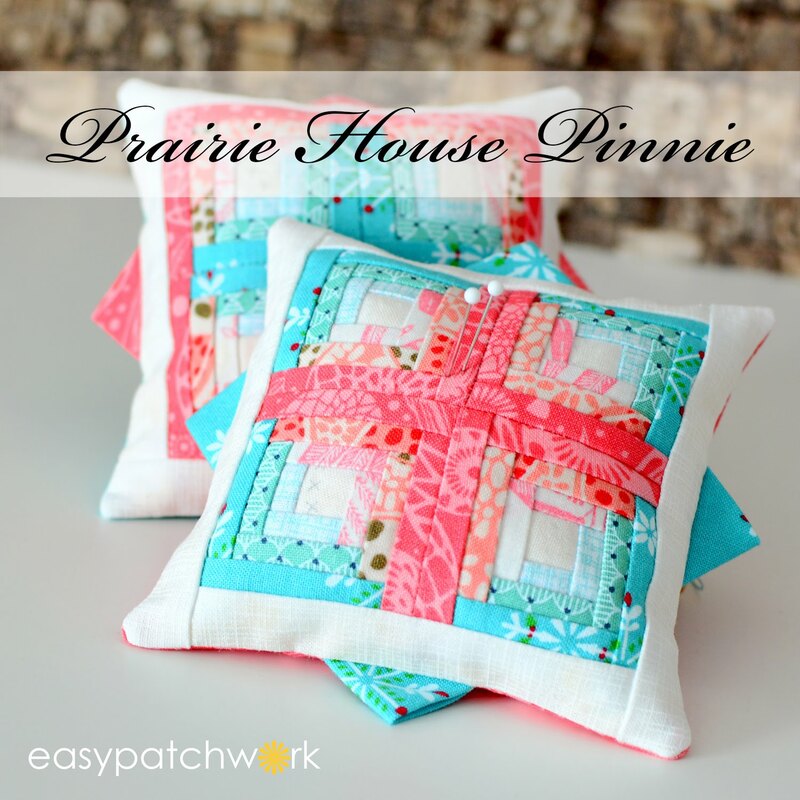 If you are a big online fabric shopper, these are probably not new to you. If you are new, this will be a good starting point. They are in no specific order. 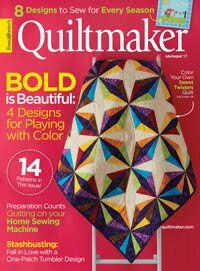 The Fat Quarter Shop - good for most current fabric - great for precuts, not so good for yardage unless you are willing to order full yard cuts. Hawthorne Threads - great for up-to-date fabrics. Great service. They run a very professional company; it usually takes six weeks for me to get my fabric due to Customs. They have a great design board which really helps to match up fabrics! 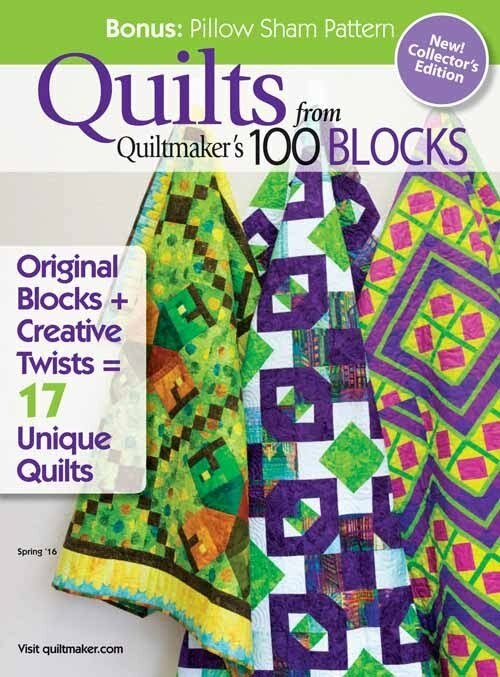 Sign up for their weekly newsletter for your chance to win fabric!! 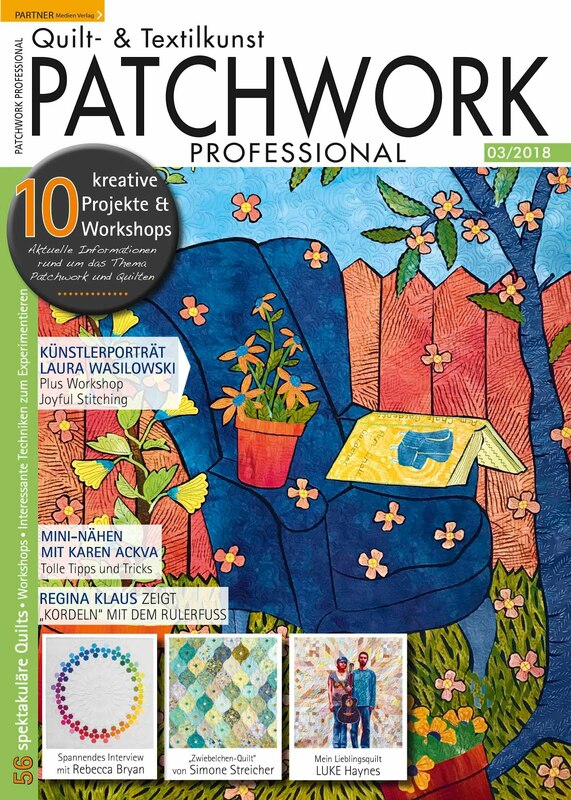 fabricworm - fresh modern fabrics. I have never ordered from them, but think they have a great store. 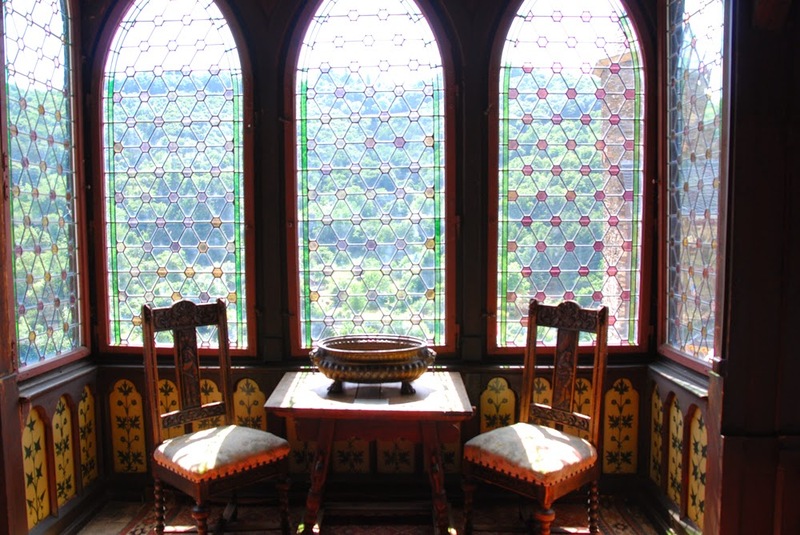 The Quilted Castle - good prices, good service! 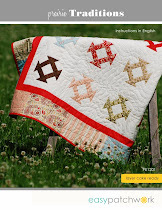 Creative Quilt Kits - very nice kits. I have found some really nice children's fabric there. 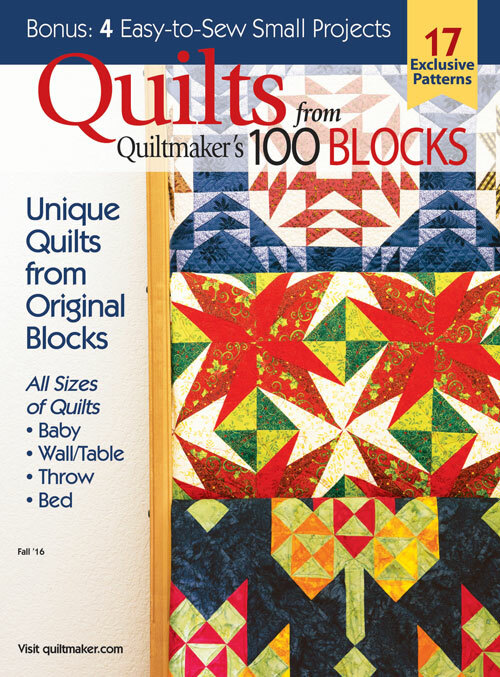 Quiltmania by Ines Khasani - a wide range of current products, lots of precuts and magazines. Good service on time! 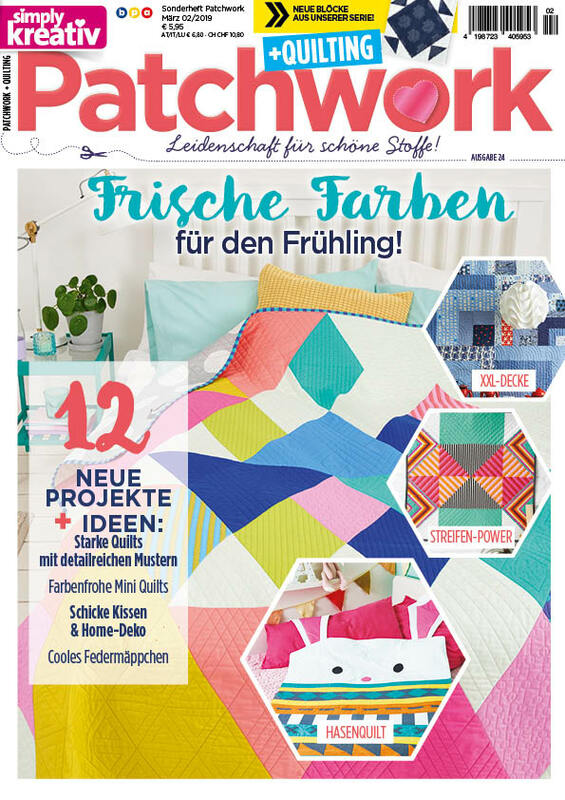 Stoffsalat - good quick service - yummy fabrics! Cotton & Color - I have never been disappointed with this company. They are timely and correct. The prices are great too. Their website is in English, French and German! I was reading the blog post from one of my friends, Paula at Mud, Pies and Pins and saw that she had a "Pay it Forward" post. I commented and low and behold...I will be receiving a gift from her sometime within the next six months, and it will totally be a surprise, because I will have forgotten about it. One of the requirements from her was to keep it going, pass it on, pay it forward again. Hmm...I got to thinking more about this. How did this all come about? What does the term mean? 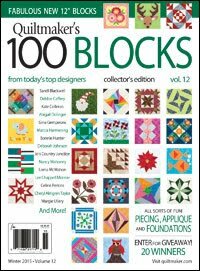 Is there an official logo, especially in the arts and crafts world? I had seen it on others' blogs dating back to 2009 and wondered about it. I did a little research and asked a few bloggers. First of all, the term means giving without intentions of receiving something in return; helping someone out, when they need it - without expectations for yourself. Wow, imagine that! Have we forgotten our own humanitarian instincts of helping others? Are we so into our own world and lives, we have forgotten that others also need our help too? When I first moved here, I thought it totally strange that Germans never smile at each other or try to make small talk. I am not the most bubbly person myself, but I do try to smile at others to make their day just a little more enjoyable. A few people think this is annoying or think I want something from them; it is not always well received. Depending on my mood, I do it anyway; it makes me feel good too. I think life is just a little bit more enjoyable when people are kind to each other. I even let others go ahead of me a the checkout, especially when I have the weekly family shopping cart to unload. These are truly random acts of kindness! And some days, when I am least expecting it, someone is nice to me too! Post on your own website about Paying it Forward. Leave a comment on the initial hosting website. Make something for three more people who leave comments on your website and sent it to them within 365 days of the original post. Hmm..is this still a random act of kindness, or is this doing something to receive something in return? 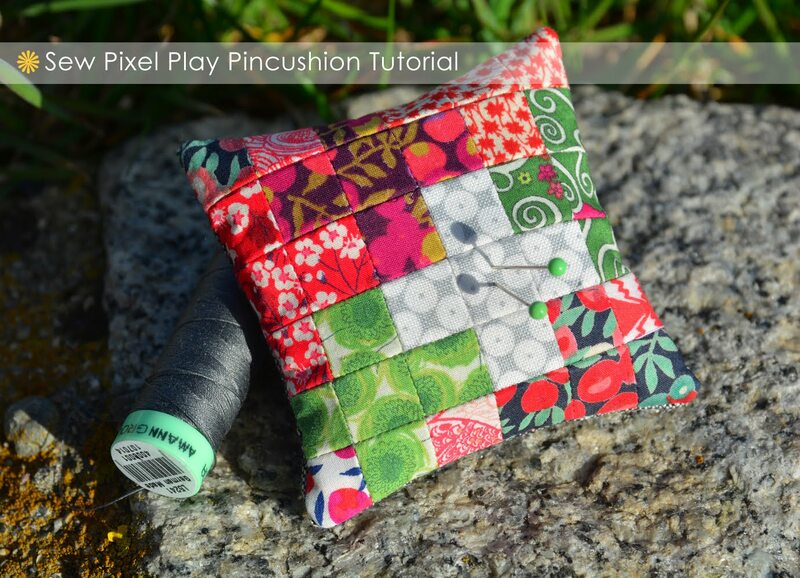 How can we really make this in line with paying it forward - giving without expectations in the craft and sewing world? What do you think? Here are some suggestions from me. Make something and donate to your local community hospice or Diakonie such as a blanket. It will be very well received and appreciated. If you belong to a quilt exchange program, make something for an old friend or exchange partner - you probably still have their address! The next time your are at your local quilt store, leave an unofficial coupon for the next person coming into the store to use. How will I be paying it forward? I am still thinking about this. I will post more about it soon, because I truly want it to be an act of kindness without commitment. I am open to any and all suggestions. 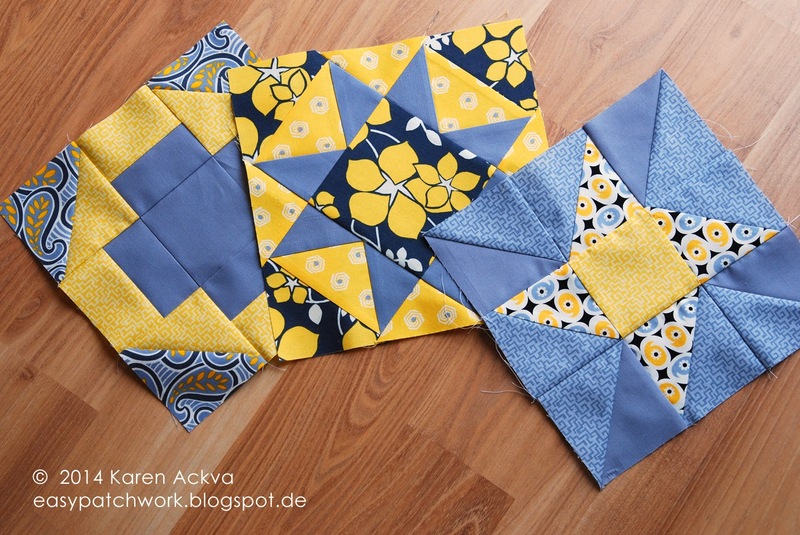 Now that I have slowed down my pace (or turned into a slow blogger), I am starting to enjoy sewing once again. 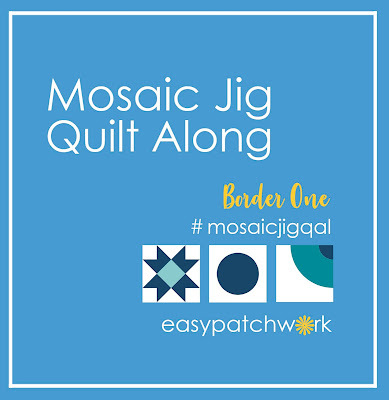 At the beginning of the year, I loaded myself down with countless Sew & Quilt Alongs and got a little overwhelmed. After realizing I had a little bit more free time (without commitment) I joined up in a new and short summer series for EQ7 called Jump Start! It is a great program for helping you feel more confident using the computer program that you probably bought when it first came out and forgot you even had it. 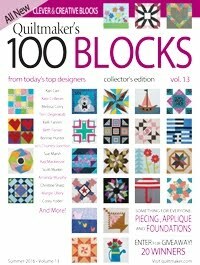 ;-) Although I have designed a few quilts with EQ, I thought it would be fun to join in the fun. I enjoy seeing what everyone else is creating! 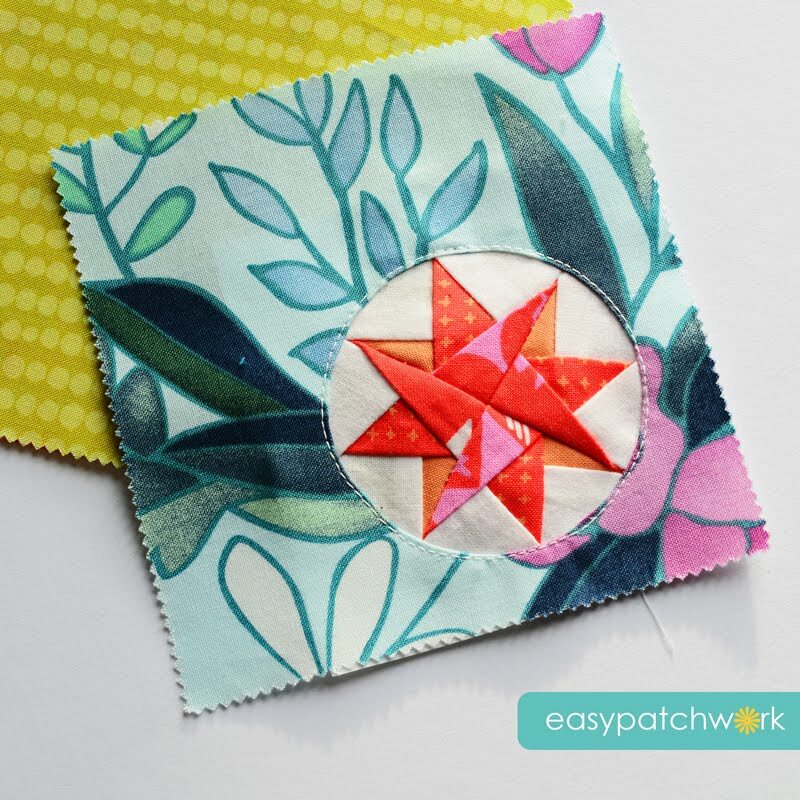 Our last lesson was to change a few lines around of the Twin Star block to create a new variation. Then we were to print out foundation pieces for a nine inch block. 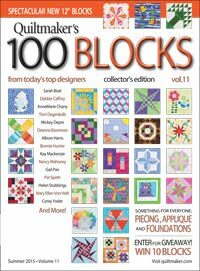 I thought this was a very great lesson for those of us who want to know more about paper piecing templates. 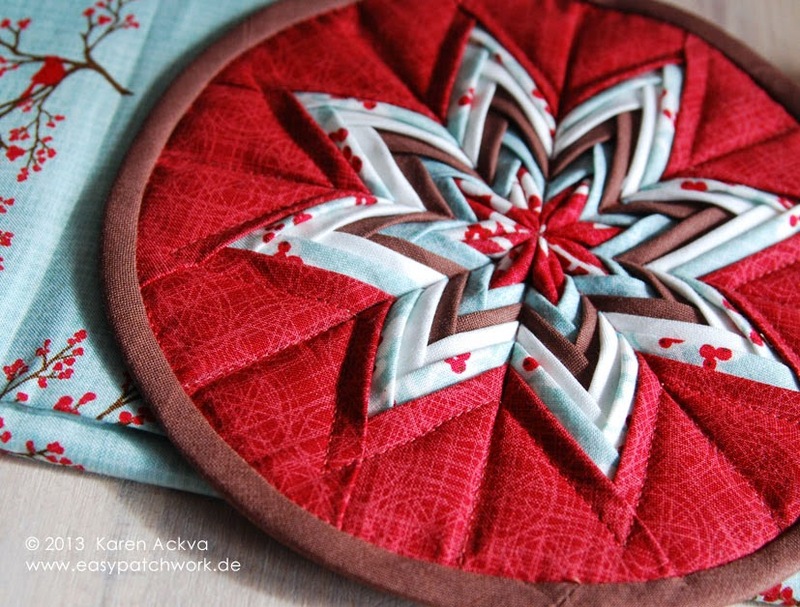 If you what to be an accurate piecer....paper piecing can help you. 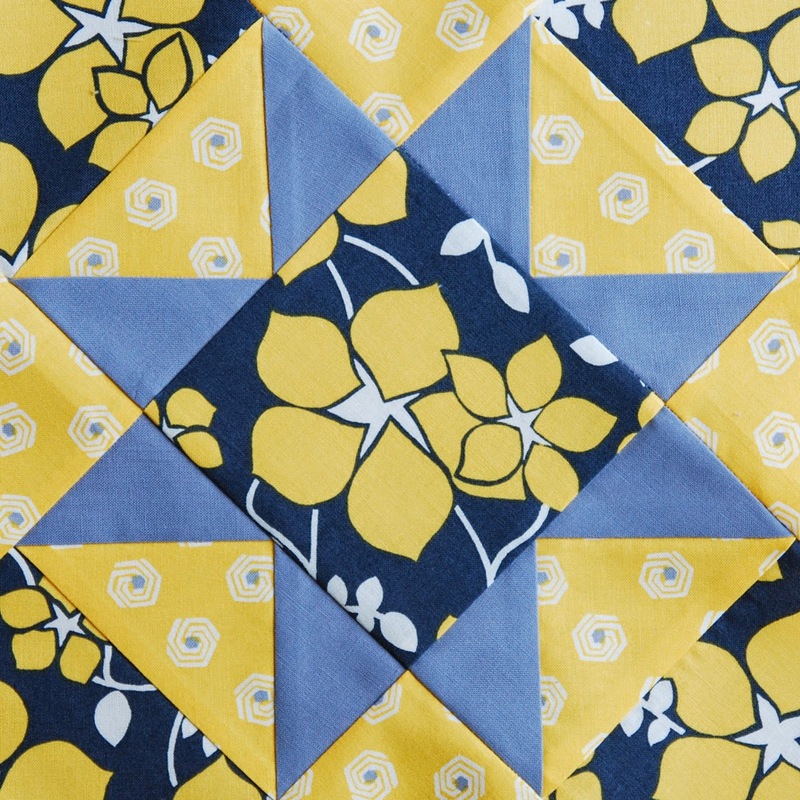 Since this block could be a little tricky with the bias triangles, I think this method is the better choice for piecing. However, I don't like to waste my precious fabric, especially this yummy line from Marcus Brothers called Next Wave by Studio 37. 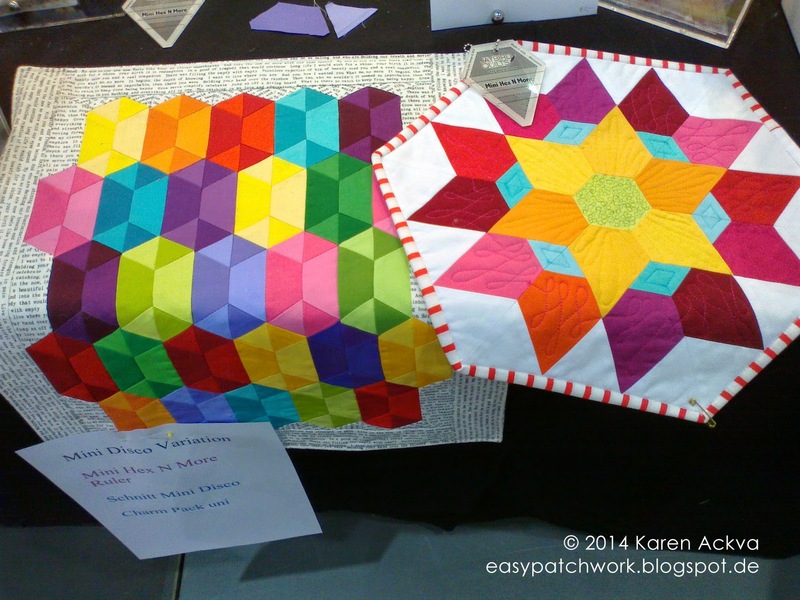 So, I would advise you to cut four inch squares to make HST as templates for sewing. 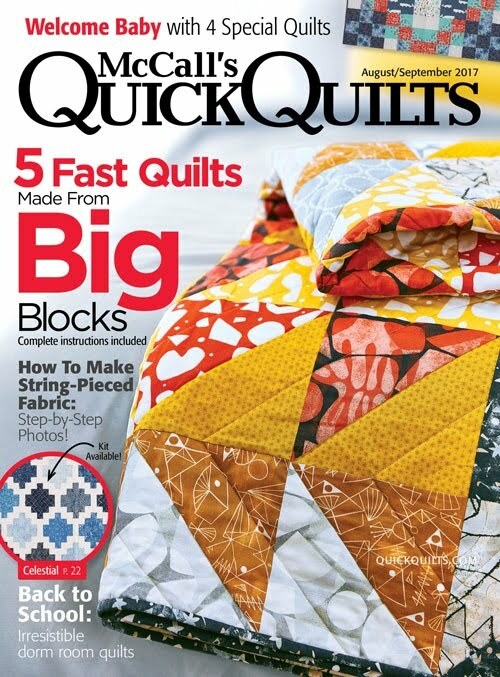 Only the fabric in the center square will be about five inches; four inch squares will accommodate the rest. I am really looking forward to the next tutorial to see if Jenny will mix it up again. (Good thing I didn't sew ahead!!) 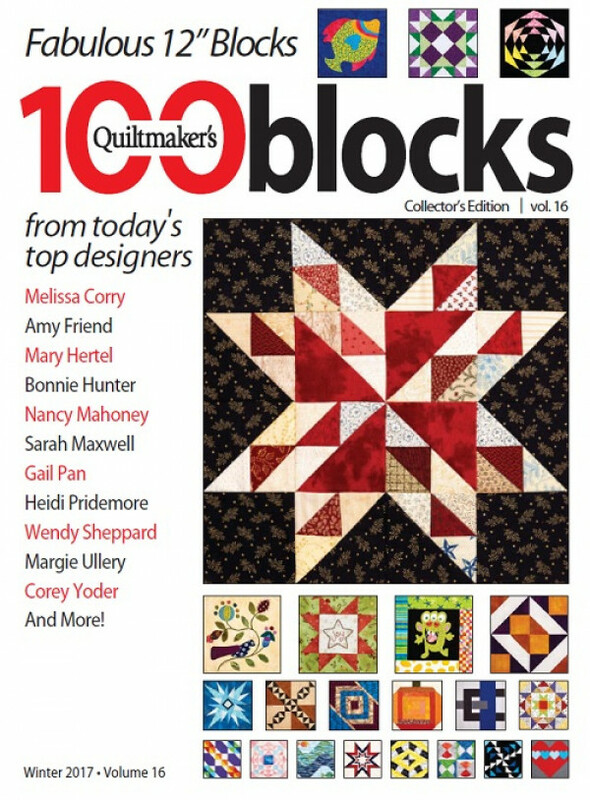 I also hope she has a lesson on an interesting border, maybe even sashing?? 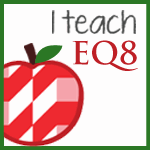 If you would like to know more about EQ7 and how the program works, you can check it out or just join in the fun. I am sure it is not too late! 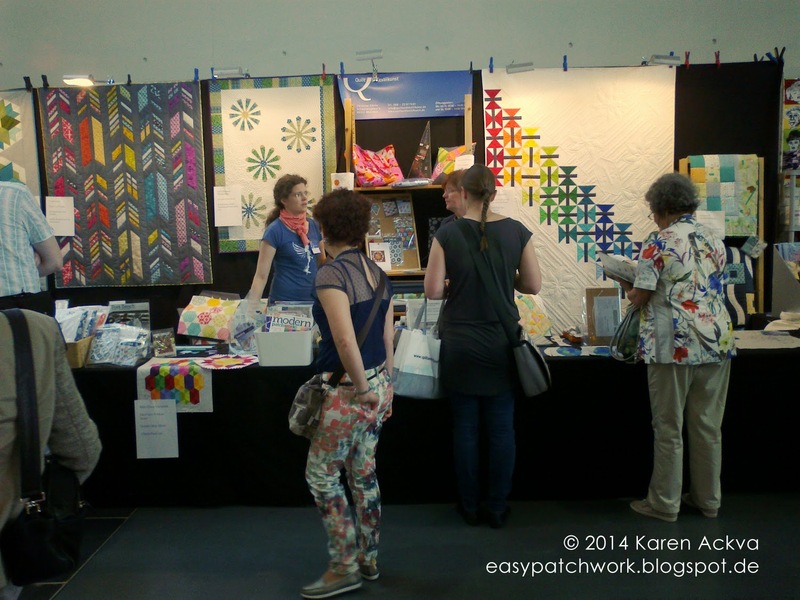 We recently had one of our biggest patchwork and hand crafting conventions in Germany in Karlsruhe. It was the first time that I had the pleasure of attending and didn't really know what to expect. 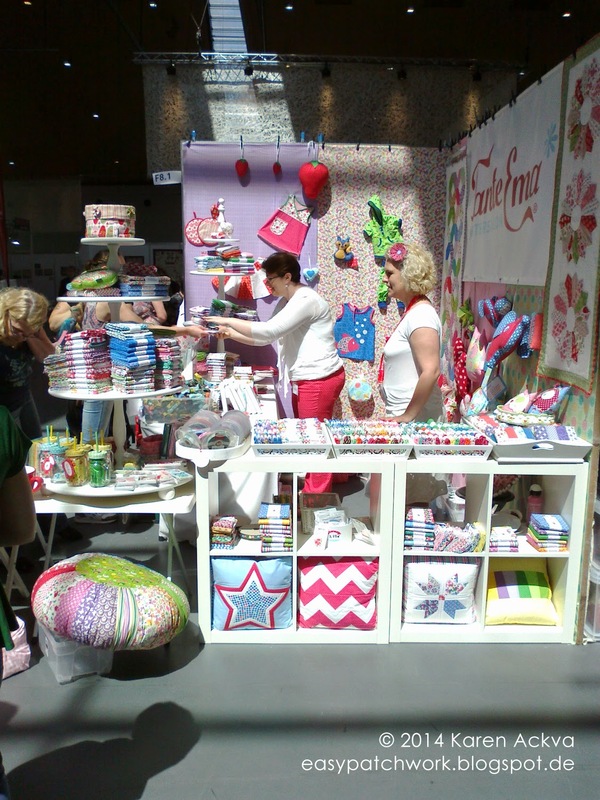 I had visited a crafting convention in Ulm, but that was almost eight years ago. A lot of things have changed since then! Or haven't they? I have at least. I know my taste and style. My family was nice enough to join me for this big outing. We made it an all day event and packed some goodies for our road trip. Since we travelled on Sunday, there was virtually no traffic; semi-trucks are not allowed to drive on the highways on Sundays until the evening hours again. And contrary to what most people think, there are speed limits on the German Autobahnen (interstate highways). 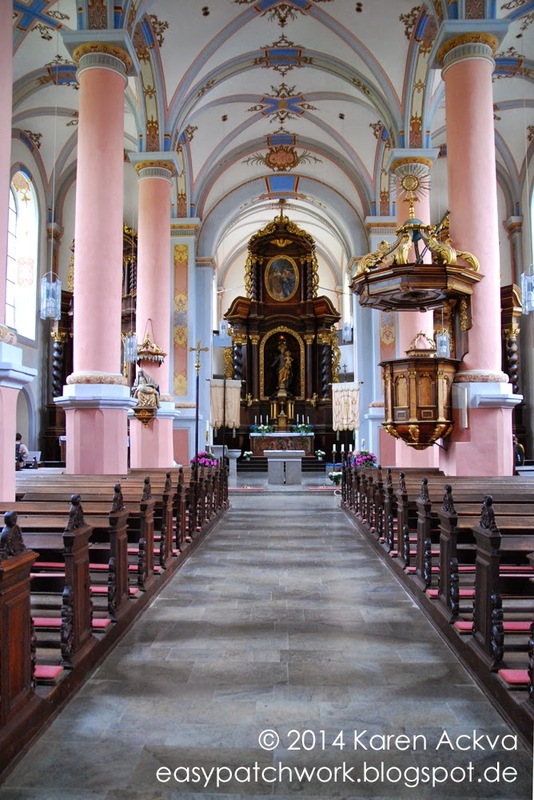 There are some sections that do not have a speed limit, but most do. 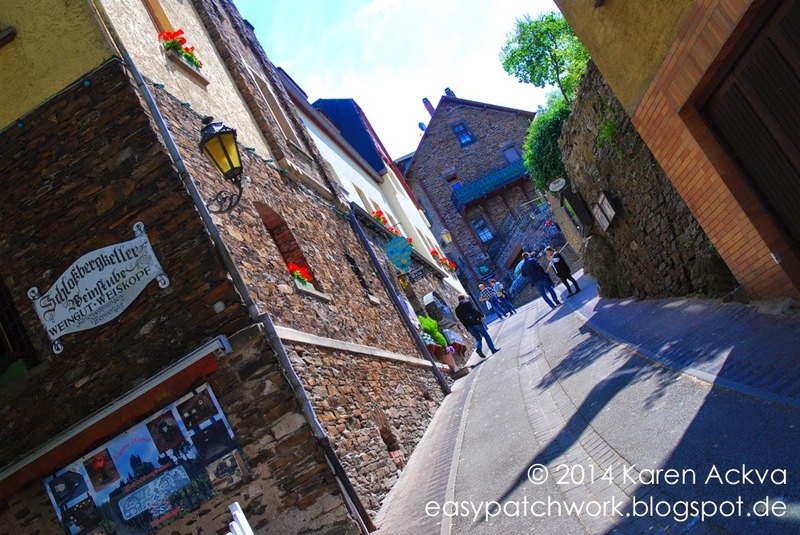 And most importantly, there are countless speed traps along the way. 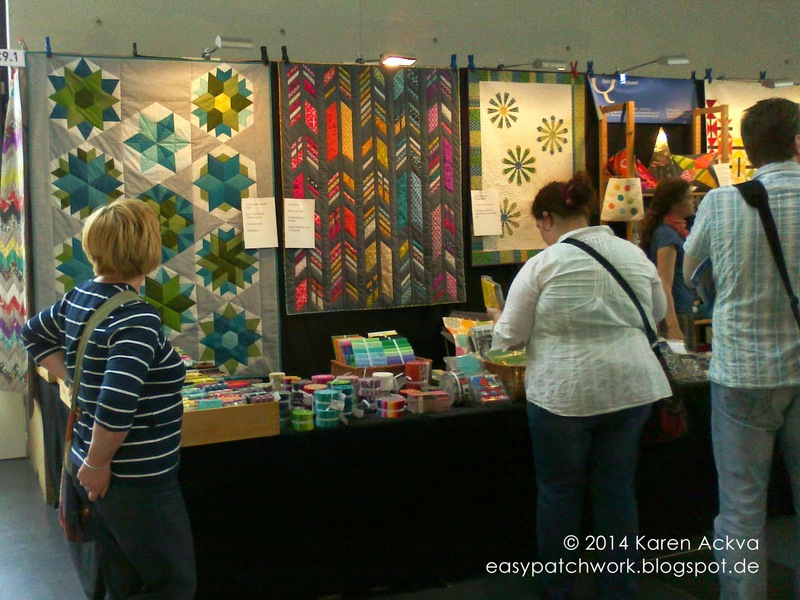 My most favorite booths were from Quilt Textilkunst and Tante Emma! 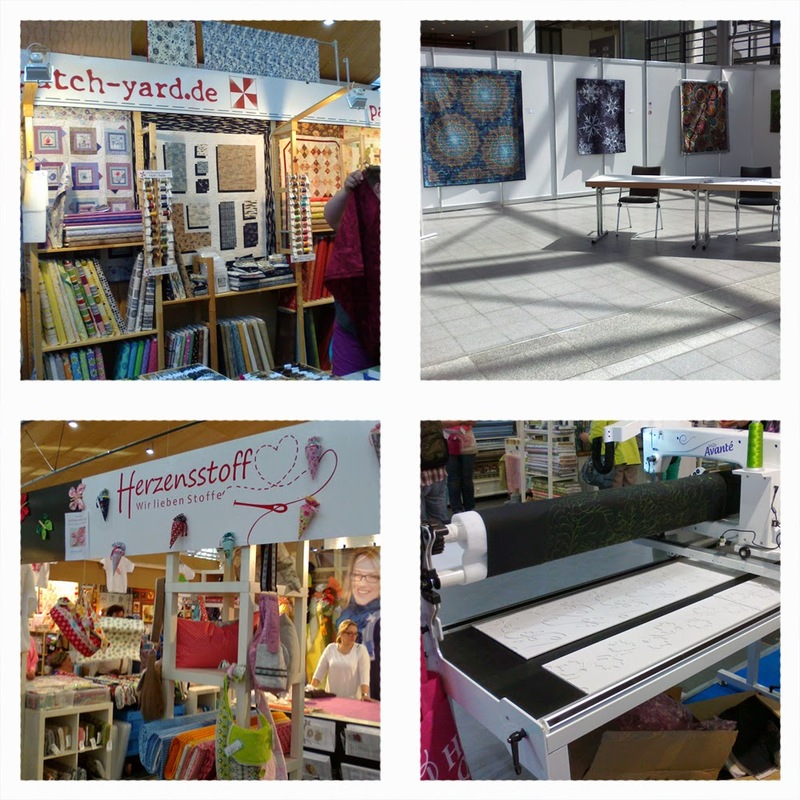 Patch-Yard and Herzensstoff were very impressive with bright colored, trendy fabrics. Paula Nadelsterns's exhibit and a new addition to the family? 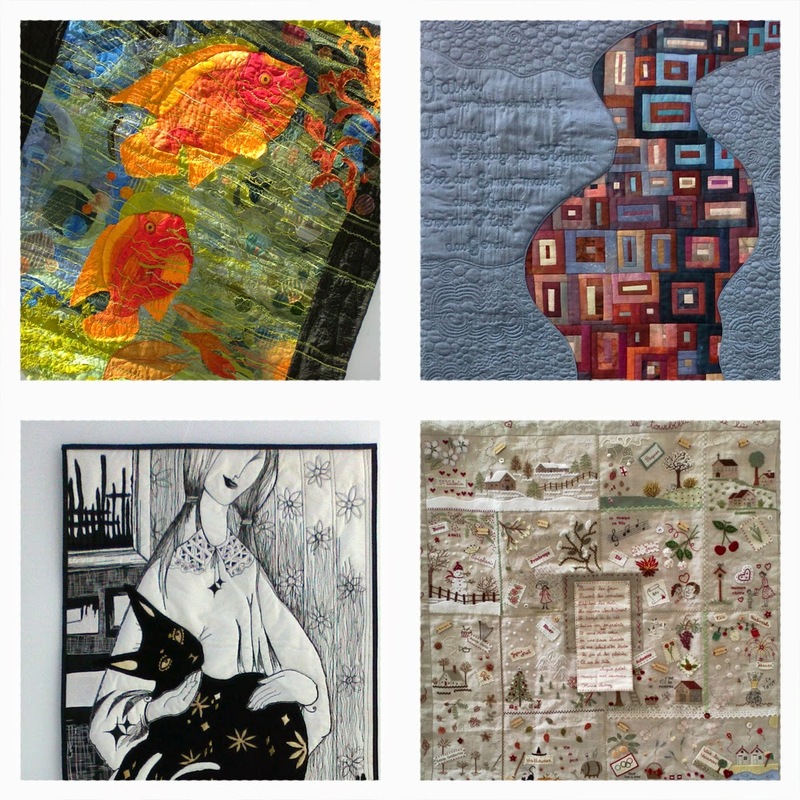 Other great impressions for the quilt exhibits! Amazings...simply amazing! 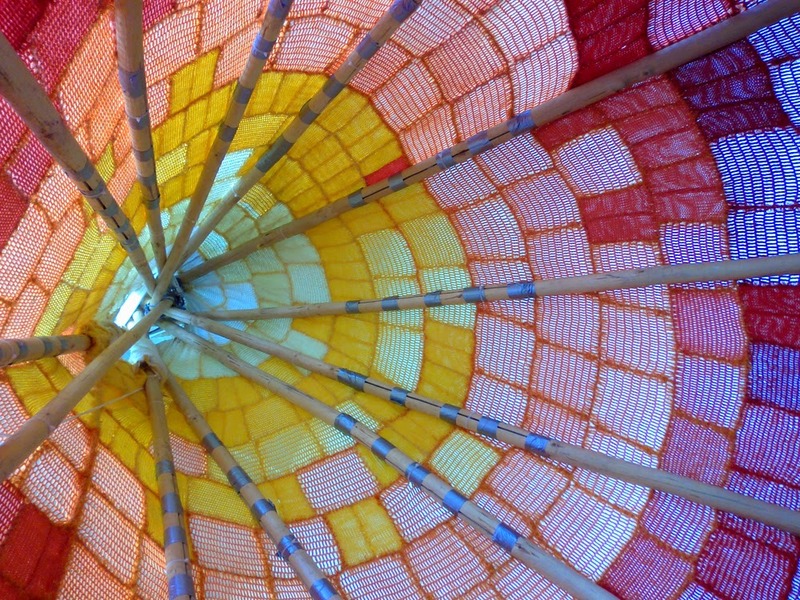 And this was the inside of a patchwork tee pee that was crocheted! Incredible! 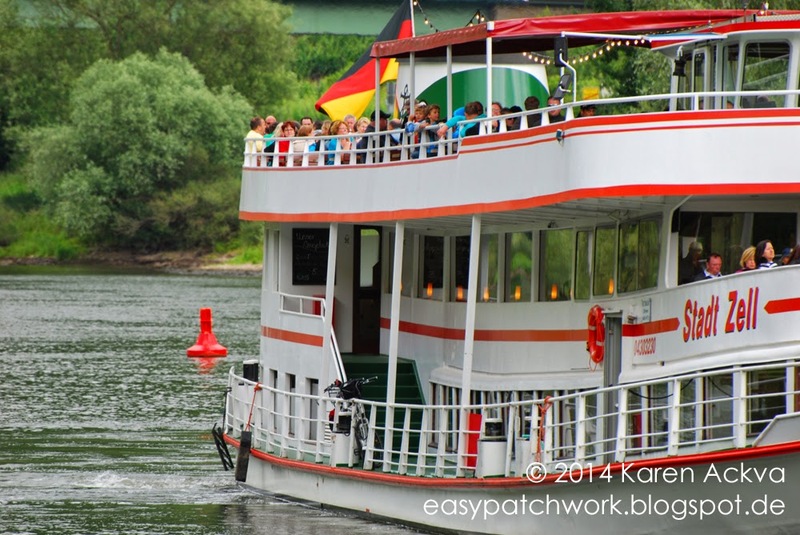 I hope you enjoyed my little tour of Impressions from Nadelwelt 2014. 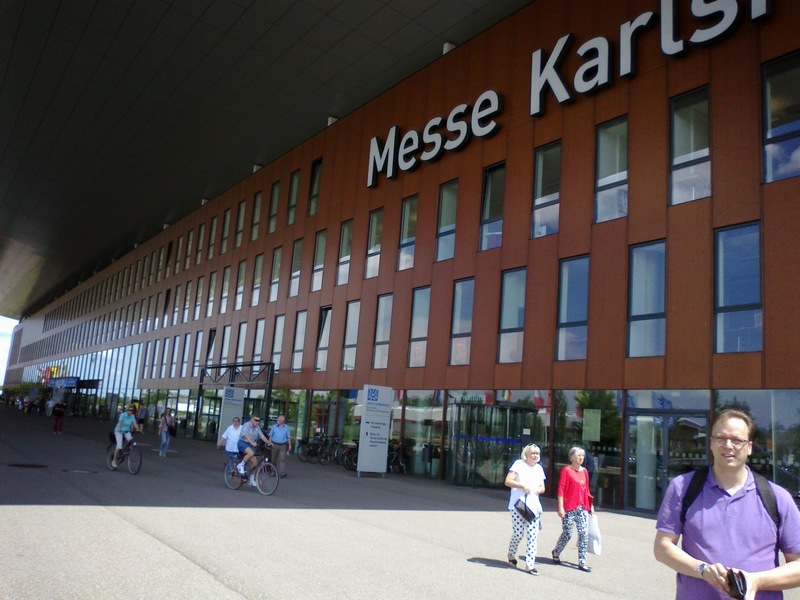 The next convention will take place 15. - 17.May 2015. Don't miss it!